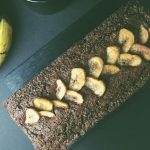 A delicious moist and fluffy gluten-free vegan blueberry banana bread (oil-free), topped with banana chips or banana slices. 1. Pre-heat oven to 350F. Line a bread load (I used a skinny narrow one that’s 12″ x 4.5″ x 3″, but a standard size loaf pan would work fine too) with parchment paper, or grease the tray well with a bit of oil or non-dairy butter instead if you prefer. Set aside. 2. Briefly process all dry ingredients in a food processor to combine into a flour. 3. Add wet ingredients and process again to combine the mixture into a batter. 4. Add the blueberries and pulse a few times briefly just to incorporate them into the batter (be careful not to process too much as you don’t want them to blend into the batter). 5. Scoop the batter into the prepared pan. Smooth out the top with the back of a spoon. Decorate with toppings. 6. Bake in a pre-heated oven for 1 hour and 5 mins (until a pick inserted in the center comes out dry). Remove from oven and cool on a cooling rack, then enjoy! *Can also use rice flour instead (as I’ve done in this muffin recipe). Other grain-based flours will likely work well as well. **Can alternatively use tapioca starch, arrowroot, or corn starch. ***I recommend Thai Kitchen brand for best results. ****I used banana chips here spontaneously because I had them on hand. They add a nice sweet crunch to the bread, though of course they’re not oil-free or refined sugar-free. You can just used fresh slices of banana instead for a fully oil-free & refined sugar-free version.